I made a quick group of articles in late 2009 called, “The Revenge of 1989” to talk about game-related things of that year. 2009 was the 20th anniversary of that year and, even then, I was plotting to make sure I’d have something decent to show for the 25th anniversary. There will be multiple updates this year to do just that and this update starts with a revamp of the original articles and a little something extra. Why am I celebrating this year so much? That video is only a hint at how many of the things this site celebrates just happened to have been made in 1989. So consider the next ten months a party as, from this day until December 31st, 2014, this site will try to give 1989 some long overdue respect. 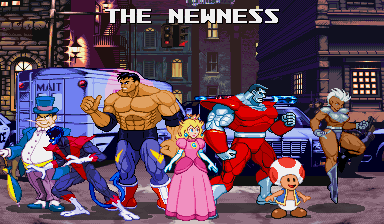 New articles will be added (including a series of awards), new sprites will be made of that year’s characters (I think it’s time I finally sprited the rest of the original Mad Gear gang) and more random crap that I can’t hint at. There will be still be non-1989 themed updates, but those games will be the focus of the year. Here are the other things you can find in this week’s update. Custom Sprites – Kunio-Kun added to the Technos gallery. Grandmaster Meio added to the Capcom gallery. Raymond Broady (Crime City) added to the Taito gallery. Alex Kidd and Kasumi (the Revenge of Shinobi) added to the Sega gallery. 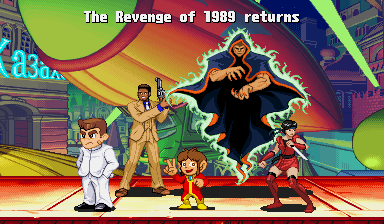 Sprites – Crime Fighters gallery updated with a lot of sprites and a few minor animations. Mini-logos – the Revenge of Shinobi added to Sega section, Crime City added to Taito section. GFX Generators – Guy and Cody were updated with a few SFA sprites and sprite edits. Here’s how the new scratch-made sprites look. It’s the Janken battle stage from Alex Kidd in the Enchanted Castle. Now you can set up your own Rock-Paper-Scissors battles. 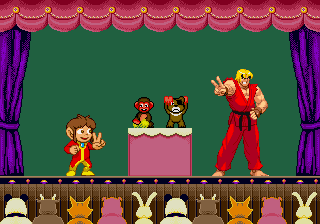 I’ve made all three Janken poses for Alex Kidd, but you’ll have to use your own memory to figure out the other characters who, like Ken, have win poses similar to rock, paper or scissors. That’s all for this update. While some of these updates might be far apart, know that some I’m putting extra time into this while working on some other neglected projects. Feel free to leave a comment about your own favorite video games from 1989.